For other uses, see Norte Chico (disambiguation). The Norte Chico civilization (also Caral or Caral-Supe civilization)[NB 1] was a complex pre-Columbian era society that included as many as thirty major population centers in what is now the Norte Chico region of north-central coastal Peru. The civilization flourished between the fourth and second millennia BC, with the formation of the first city generally dated to around 3500 BC, at Huaricanga, in the Fortaleza area. It is from 3100 BC onward that large-scale human settlement and communal construction become clearly apparent, which lasted until a period of decline around 1800 BC. Since the early 21st century, it has been established as the oldest known civilization in the Americas. This civilization flourished along three rivers, the Fortaleza, the Pativilca, and the Supe. These river valleys each have large clusters of sites. Further south, there are several associated sites along the Huaura River. The alternative name, Caral-Supe, is derived from the city of Caral in the Supe Valley, a large and well-studied Norte Chico site. Complex society in Norte Chico arose a millennium after Sumer in Mesopotamia, was contemporaneous with the Egyptian pyramids, and predated the Mesoamerican Olmec by nearly two millennia. In archaeological nomenclature, Norte Chico is a pre-ceramic culture of the pre-Columbian Late Archaic; it completely lacked ceramics and apparently had almost no visual art. The most impressive achievement of the civilization was its monumental architecture, including large earthwork platform mounds and sunken circular plazas. Archaeological evidence suggests use of textile technology and, possibly, the worship of common god symbols, both of which recur in pre-Columbian Andean cultures. Sophisticated government is assumed to have been required to manage the ancient Norte Chico. Questions remain over its organization, particularly the influence of food resources on politics. Archaeologists have been aware of ancient sites in the area since at least the 1940s; early work occurred at Aspero on the coast, a site identified as early as 1905, and later at Caral further inland. In the late 1990s, Peruvian archaeologists, led by Ruth Shady, provided the first extensive documentation of the civilization with work at Caral. A 2001 paper in Science, providing a survey of the Caral research, and a 2004 article in Nature, describing fieldwork and radiocarbon dating across a wider area, revealed Norte Chico's full significance and led to widespread interest. Norte Chico has established an earlier estimate for complex societies in the Peruvian region by more than one thousand years. The Chavín culture, circa 900 BC, had long been considered the first civilization of the area. It is still regularly cited as such in general works. The discovery of Norte Chico has also shifted the focus of research away from the highland areas of the Andes and lowlands adjacent to the mountains (where the Chavín, and later Inca, had their major centers) to the Peruvian littoral, or coastal regions. Norte Chico is located in a north-central area of the coast, approximately 150 to 200 km north of Lima, roughly bounded by the Lurín Valley on the south and the Casma Valley on the north. It comprises four coastal valleys: the Huaura, Supe, Pativilca, and Fortaleza; known sites are concentrated in the latter three, which share a common coastal plain. The three principal valleys cover only 1,800 km², and research has emphasized the density of the population centers. The Peruvian littoral appears an "improbable, even aberrant" candidate for the "pristine" development of civilization, compared to other world centers. It is extremely arid, bounded by two rain shadows (caused by the Andes to the east, and the Pacific trade winds to the west). The region is punctuated by more than 50 rivers that carry Andean snowmelt. The development of widespread irrigation from these water sources is seen as decisive in the emergence of Norte Chico; since all of the monumental architecture at various sites has been found close to irrigation channels. The radiocarbon work of Jonathan Haas et al., found that 10 of 95 samples taken in the Pativilca and Fortaleza areas dated from before 3500 BC; the oldest, dating from 9210 BC, provides "limited indication" of human settlement during the Pre-Columbian Early Archaic era. Two dates of 3700 BC are associated with communal architecture, but are likely to be anomalous. It is from 3200 BC onward that large-scale human settlement and communal construction are clearly apparent. Mann, in a survey of the literature in 2005, suggests "sometime before 3200 BC, and possibly before 3500 BC" as the beginning date of the Norte Chico formative period. He notes that the earliest date securely associated with a city is 3500 BC, at Huaricanga, in the Fortaleza area of the north, based on Haas' dates. Haas' early third millennium dates suggest that the development of coastal and inland sites occurred in parallel. But, from 2500 to 2000 BC, during the period of greatest expansion, the population and development decisively shifted toward the inland sites. All development apparently occurred at large interior sites such as Caral, though they remained dependent on fish and shellfish from the coast. The peak in dates is in keeping with Shady's dates at Caral, which show habitation from 2627 BC to 2020 BC. That coastal and inland sites developed in tandem remains disputed, however (see next section). Circa 1800 BC, the Norte Chico civilization began to decline, with more powerful centers appearing to the south and north along the coast, and to the east inside the belt of the Andes. Norte Chico's success at irrigation-based agriculture may have contributed to its being eclipsed. One researcher notes that "when this civilization is in decline, we begin to find extensive canals farther north. People were moving to more fertile ground and taking their knowledge of irrigation with them." It would be a thousand years before the rise of the next great Peruvian culture, the Chavín. Cultural links with the highland areas have been noted by archaeologists. In particular, the links with the Kotosh Religious Tradition have been suggested. Numerous architectural features found among the settlements of Supe, including subterranean circular courts, stepped pyramids and sequential platforms, as well as material remains and their cultural implications, excavated at Aspero and the valley sites we are digging (Caral, Chupacigarro, Lurihuasi, Miraya), are shared with other settlements of the area that participated in what is known as the Kotosh Religious Tradition. Most specific among these features are rooms with benches and hearths with subterranean ventilation ducts, wall niches, biconvex beads, musical flutes, etc. A broad outline of the Norte Chico diet has been suggested. At Caral, the edible domesticated plants noted by Shady are squash, beans, lúcuma, guava, pacay (Inga feuillei), and sweet potato. Haas et al. noted the same foods in their survey further north, while adding avocado and achira. In 2013, good evidence for maize was also documented by Haas et al. (see below). There was also a significant seafood component at both coastal and inland sites. Shady notes that "animal remains are almost exclusively marine" at Caral, including clams and mussels, and large amounts of anchovies and sardines. That the anchovy fish reached inland is clear, although Haas suggests that "shellfish [which would include clams and mussels], sea mammals, and seaweed do not appear to have been significant portions of the diet in the inland, non-maritime sites". The role of seafood in the Norte Chico diet has aroused debate. Much early fieldwork was done in the region of Aspero on the coast, before the full scope and inter-connectedness of the several sites of the civilization were realized. In a 1973 paper, Michael E. Moseley contended that a maritime subsistence (seafood) economy had been the basis of the society and its remarkably early flourishing, a theory later elaborated as a "maritime foundation of Andean civilization" (MFAC). He also confirmed a previously observed lack of ceramics at Aspero, and deduced that "hummocks" on the site constituted the remains of artificial platform mounds. This thesis of a maritime foundation was contrary to the general scholarly consensus that the rise of civilization was based on intensive agriculture, particularly of at least one cereal. The production of agricultural surpluses had long been seen as essential in promoting population density and the emergence of complex society. Moseley's ideas would be debated and challenged (that maritime remains and their caloric contribution were overestimated, for example) but have been treated as plausible as late as Mann's summary of the literature in 2005. Concomitant to the maritime subsistence hypothesis was an implied dominance of sites immediately adjacent to the coast over other centers. This idea was shaken by the realization of the magnitude of Caral, an inland site. Supplemental to Shady's 1997 article dating Caral, a 2001 Science news article emphasized the dominance of agriculture and also suggested that Caral was the oldest urban center in Peru (and the entire Americas). It deprecated the idea that civilization might have begun adjacent to the coast and then moved inland. One archaeologist was quoted as suggesting that "rather than coastal antecedents to monumental inland sites, what we have now are coastal satellite villages to monumental inland sites". These assertions were quickly challenged by Sandweiss and Moseley, who observed that Caral, though the largest and most complex Preceramic site, is not the oldest. They admitted the importance of agriculture to industry and to augment diet, while broadly affirming "the formative role of marine resources in early Andean civilization". Scholars now agree that the inland sites did have significantly greater populations, and that there were "so many more people along the four rivers than on the shore that they had to have been dominant". The remaining question is which of the areas developed first and created a template for subsequent development. Haas rejects suggestions that maritime development at sites immediately adjacent to the coast was initial, pointing to contemporaneous development based on his dating. Moseley remains convinced that coastal Aspero is the oldest site, and that its maritime subsistence served as a basis for the civilization. Cotton (of the species Gossypium barbadense) likely provided the basis of the dominance of inland over coast (whether development was earlier, later, or contemporaneous). Though not edible, it was the most important product of irrigation in the Norte Chico, vital to the production of fishing nets (that in turn provided maritime resources) as well as to textiles and textile technology. Haas notes that "control over cotton allows a ruling elite to provide the benefit of cloth for clothing, bags, wraps, and adornment". He is willing to admit to a mutual dependency dilemma: "The prehistoric residents of the Norte Chico needed the fish resources for their protein and the fishermen needed the cotton to make the nets to catch the fish." Thus, identifying cotton as a vital resource produced in the inland does not by itself resolve the issue of whether the inland centers were a progenitor for the coast, or vice versa. Moseley argues that successful maritime centers would have moved inland to find cotton. The exact relationship between food resources and political organization remains unresolved. Archaeological testing at a number of sites in the Norte Chico region of the north central coast provides a broad range of empirical data on the production, processing, and consumption of maize. New data drawn from coprolites, pollen records, and stone tool residues, combined with 126 radiocarbon dates, demonstrate that maize was widely grown, intensively processed, and constituted a primary component of the diet throughout the period from 3000 to 1800 B.C. The Norte Chico chiefdoms were "almost certainly theocratic, though not brutally so", according to Mann. Construction areas show possible evidence of feasting, which would have included music and likely alcohol, suggesting an elite able to both mobilize and reward the population. The degree of centralized authority is difficult to ascertain, but architectural construction patterns are indicative of an elite that, at least in certain places at certain times, wielded considerable power: while some of the monumental architecture was constructed incrementally, other buildings, such as the two main platform mounds at Caral, appear to have been constructed in one or two intense construction phases. As further evidence of centralized control, Haas points to remains of large stone warehouses found at Upaca, on the Pativilca, as emblematic of authorities able to control vital resources such as cotton. Haas suggests that the labour mobilization patterns revealed by the archaeological evidence point to a unique emergence of human government, one of two alongside Sumer (or three, if Mesoamerica is included as a separate case). While in other cases, the idea of government would have been borrowed or copied, in this small group, government was invented. Other archaeologists have rejected such claims as hyperbolic. He finds the first two present in ancient Norte Chico. Economic authority would have rested on the control of cotton and edible plants and associated trade relationships, with power centered on the inland sites. Haas tentatively suggests that the scope of this economic power base may have extended widely: there are only two confirmed shore sites in the Norte Chico (Aspero and Bandurria) and possibly two more, but cotton fishing nets and domesticated plants have been found up and down the Peruvian coast. It is possible that the major inland centers of Norte Chico were at the center of a broad regional trade network centered on these resources. Discover magazine, citing Shady, suggests a rich and varied trade life: "[Caral] exported its own products and those of Aspero to distant communities in exchange for exotic imports: Spondylus shells from the coast of Ecuador, rich dyes from the Andean highlands, hallucinogenic snuff from the Amazon." (Given the still limited extent of Norte Chico research, such claims should be treated circumspectly.) Other reports on Shady's work indicate Caral traded with communities in the jungle farther inland and, possibly, with people from the mountains. The act of architectural construction and maintenance may also have been a spiritual or religious experience: a process of communal exaltation and ceremony. Shady has called Caral "the sacred city" (la ciudad sagrada): socio-economic and political focus was on the temples, which were periodically remodeled, with major burnt offerings associated with the remodeling. Has notes the absence of any suggestion of physical bases of power, that is, defensive construction. There is no evidence of warfare "of any kind or at any level during the Preceramic Period". Mutilated bodies, burned buildings, and other tell-tale signs of violence are absent, and settlement patterns are completely non-defensive. The evidence of the development of complex government in the absence of warfare is in marked contrast to archaeological theory, which suggests that human beings move away from kin-based groups to larger units resembling "states" for mutual defense of often scarce resources. A vital resource was present: arable land generally, and the cotton crop specifically, but the move to greater complexity was apparently not driven by the need for defense or warfare. Norte Chico sites are known for their density of large sites with immense architecture. Haas argues that the density of sites in such a small area is globally unique for a nascent civilization. During the third millennium BC, Norte Chico may have been the most densely populated area of the world (excepting, possibly, Northern China). The Supe, Pativilca, Fortaleza, and Huaura River valleys each have several related sites. Evidence from the ground-breaking work of 1973 at Aspero, at the mouth of the Supe Valley, suggested a site of approximately 13 hectares (32 acres). Surveying of the midden suggested extensive prehistoric construction activity. Small-scale terracing is noted, along with more sophisticated platform mound masonry. As many as eleven artificial mounds "could be" present. Moseley calls these "Corporate Labor Platforms", given that their size, layout, and construction materials and techniques would have required an organized workforce. The survey of the northern rivers found sites between 10 and 100 ha (25 and 247 acres); between one and seven large platform mounds—rectangular, terraced pyramids—were discovered, ranging in size from 3,000 m3 (110,000 cu ft) to over 100,000 m3 (3,500,000 cu ft). Shady notes that the central zone of Caral, with monumental architecture, covers an area of just over 65 hectares (160 acres). Six platform mounds, numerous smaller mounds, two sunken circular plazas, and a variety of residential architecture were also discovered at this site. In this way, the people of Norte Chico achieved formidable architectural success. The largest of the platforms mounds at Caral, the Piramide Mayor, measures 160 by 150 m (520 by 490 ft) and rises 18 m (59 ft) high. In its summation of the 2001 Shady paper, the BBC suggests workers would have been "paid or compelled" to work on centralized projects of this sort, with dried anchovies possibly serving as a form of currency. Mann points to "ideology, charisma, and skilfully timed reinforcement" from leaders. When compared to the common Eurasian models of the development of civilization, Norte Chico's differences are striking. A total lack of ceramics persists across the period. The BBC observes that Norte Chico's people would have roasted their various crops, with no pots to boil them. The lack of pottery was accompanied by a lack of archaeologically apparent art. In conversation with Mann, Alvaro Ruiz observes: "In the Norte Chico we see almost no visual arts. No sculpture, no carving or bas-relief, almost no painting or drawing—the interiors are completely bare. What we do see are these huge mounds—and textiles." While the absence of ceramics appears anomalous, the presence of textiles is intriguing. Quipu (or khipu), string-based recording devices, have been found at Caral, suggesting a writing, or "proto-writing", system at Norte Chico. (The discovery was reported by Mann in Science in 2005, but has not been formally published or described by Shady.) The exact use of quipu in this and later Andean cultures has been widely debated. Originally it was believed to be simply a mnemonic used to record numeric information, such as a count of items bought and sold. Evidence has emerged that the quipu may also have recorded logographic information in the same way writing does. Research has focused on the much larger sample of a few hundred quipu dating to Inca times; the Norte Chico discovery remains singular and undeciphered. Other finds at Norte Chico have proved suggestive. While visual arts appear absent, the people may have played instrumental music: thirty-two flutes, crafted from pelican bone, have been discovered. The oldest known depiction of the Staff God was found in 2003 on some broken gourd fragments in a burial site in the Pativilca River Valley and carbon dated to 2250 BCE. While still fragmentary, such archaeological evidence corresponds to the patterns of later Andean civilization and may indicate that Norte Chico served as a template. Along with the specific finds, Mann highlights "the primacy of exchange over a wide area, the penchant for collective, festive civic work projects, [and] the high valuation of textiles and textile technology" within Norte Chico as patterns that would recur later in the Peruvian cradle of civilization. The magnitude of the Norte Chico discovery has brought academic controversy in its wake. The "monumental feud", as described by Archaeology, has included "public insults, a charge of plagiarism, ethics inquiries in both Peru and the United States, and complaints by Peruvian officials to the U.S. government." The lead author of the seminal paper of April 2001 was Peruvian Ruth Shady, with co-authors Jonathan Haas and Winifred Creamer, a married United States team; the coauthoring was reportedly suggested by Haas, in the hopes that the involvement of United States researchers would help secure funds for carbon dating as well as future research funding. Later, Shady charged the couple with plagiarism and insufficient attribution, suggesting the pair had received credit for her research, which had been going on since 1994. The number of urban centers (17) identified in the Supe Valley, and their magnitude, requires a great quantity of surplus labor for their construction, maintenance, remodeling and burial. If we consider exclusively the productive capacity of this small valley, this investment could not have been realized without the participation of the communities of neighboring valleys. In 2004, Haas et al. wrote that "Our recent work in the neighboring Pativilca and Fortaleza has revealed that Caral and Aspero were but two of a much larger number of major Late Archaic sites in the Norte Chico", while only noting Shady in footnotes. Attribution of this type is what has angered Shady and her supporters. Shady's position has been hampered by a lack of funding for archeological research in her native Peru, as well as the media advantages of North American researchers in disputes of this type. Haas and Creamer were cleared of the plagiarism charge by their institutions. The Chicago Field Museum of Natural History’s science advisory council rebuked Haas for press releases and web pages that gave too little credit to Shady and inflated the couple’s role as discoverers. The dispute remains heated. Scholars have concerns that it could make it more difficult for United States archaeologists to gain permission to work in Peru. ↑ The name is disputed. English-language sources use Norte Chico (Spanish: "Little North") per Haas et al. (2004). Caral or Caral-Supe are more likely to be found in Spanish language sources per Shady. This article follows usage in recent English-language sources and employs Norte Chico, but the title is not definitive. Peruvian Norte Chico should not be confused with the Chilean region of the same name. ↑ "Interior" and "inland" do not refer here to the mountainous interior of Peru proper. All of the Norte Chico sites are broadly coastal, within 100 kilometres (62 mi) of the coast and within the Peruvian littoral (Caral is 23 kilometres (14 mi) inland). "Interior" and "inland" are used here to contrast with sites that are literally adjacent to the ocean. ↑ Krysztof Makowski, as reported by Mann (1491), suggests there is little evidence that Andean civilizations worshipped an overarching deity. The figure may have been carved by a later civilization onto an ancient gourd, as it was found in strata dating between 900 and 1300 AD. 1 2 3 4 5 6 7 8 9 10 11 12 13 14 15 Mann, Charles C. (2006) . 1491: New Revelations of the Americas Before Columbus. Vintage Books. pp. 199–212. ISBN 1-4000-3205-9. 1 2 3 4 5 6 7 Haas, Jonathan; Winifred Creamer; Alvaro Ruiz (23 December 2004). "Dating the Late Archaic occupation of the Norte Chico region in Peru". Nature. 432 (7020): 1020–1023. doi:10.1038/nature03146. PMID 15616561. 1 2 3 "Archaeologists shed new light on Americas' earliest known civilization" (Press release). Northern Illinois University. 2004-12-22. Archived from the original on February 9, 2007. Retrieved 2007-02-01. 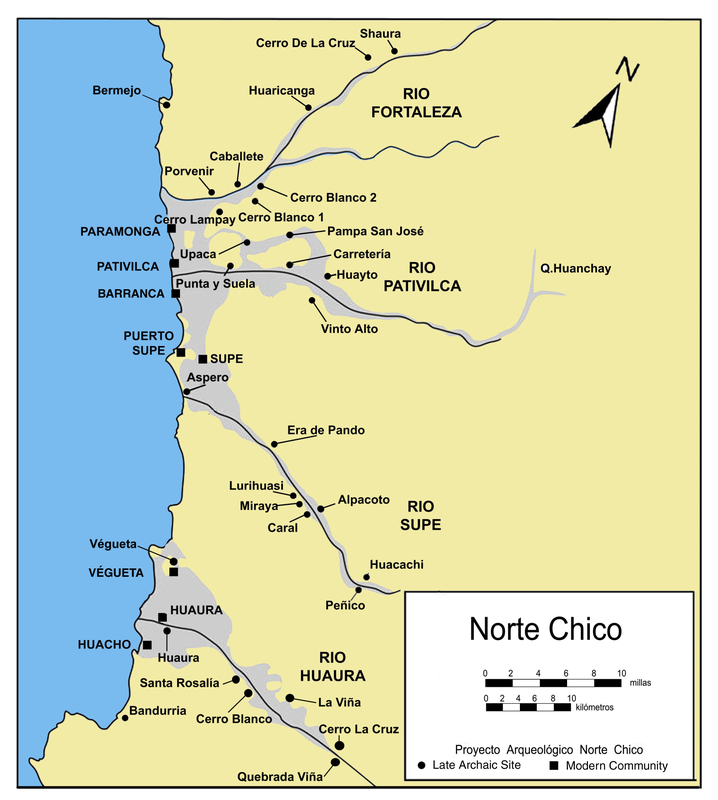 ↑ "detailed map of Norte Chico sites". ↑ "Sacred City of Caral-Supe". UNESCO. Retrieved 2011-06-09. 1 2 3 4 Moseley, Michael E.; Gordon R. Willey (1973). "Aspero, Peru: A Reexamination of the Site and Its Implications". American Antiquity. Society for American Archaeology. 38 (4): 452–468. doi:10.2307/279151. JSTOR 279151. "We see the site as a 'peaking' of an essentially non-agricultural economy. Subsistence was still, basically, from the sea. But such subsistence supported a sedentary style of life, with communities of appreciable size." 1 2 3 Shady Solís, Ruth Martha (1997). La ciudad sagrada de Caral-Supe en los albores de la civilización en el Perú (in Spanish). Lima: UNMSM, Fondo Editorial. Retrieved 2007-03-03. 1 2 3 4 5 6 7 8 Shady Solis, Ruth; Jonathan Haas; Winifred Creamer (27 April 2001). "Dating Caral, a Preceramic Site in the Supe Valley on the Central Coast of Peru". Science. 292 (5517): 723–726. doi:10.1126/science.1059519. PMID 11326098. ↑ See CNN, for instance. Given the tentative nature of much research surrounding Norte Chico, readers should be cautious of claims in general news sources. ↑ "History of Peru". HISTORYWORLD. Retrieved 2007-01-31. ↑ Roberts, J.M. (2004). The New Penguin History of the World (Fourth ed.). London: Penguin Books. p. 153. [The Americas] are millennia behind the development of civilization elsewhere, whatever the cause of that may be. "The implied laggardness appears disproven by Norte Chico; in his work, Mann is sharply critical of the inattention provided the Pre-Columbian Americas." 1 2 3 4 5 6 7 8 9 10 Haas, Jonathan; Winifred Creamer; Alvaro Ruiz (2005). "Power and the Emergence of Complex Polities in the Peruvian Preceramic". Archaeological Papers of the American Anthropological Association. 14 (1): 37–52. doi:10.1525/ap3a.2004.14.037. 1 2 Pringle, Heather (2001-04-27). "The First Urban Center in the Americas". Science. 292 (5517): 621. doi:10.1126/science.292.5517.621. PMID 11330310. "The claim in this Science 'News of the Week' column that Caral is the oldest urban center in the Americas is highly uncertain." ↑ Lucy Salazar-Burger, 1985, The early ceremonial center of Huaricoto. In Early Ceremonial Architecture in the Andes, edited by Christopher B. Donnan, pp. 111–138. Dumbarton Oaks Research Library and Collection, Washington, D.C.
1 2 Haas, J.; Creamer, W.; Huaman Mesia, L.; Goldstein, D.; Reinhard, K.; Rodriguez, C. V. (2013). "Evidence for maize (Zea mays) in the Late Archaic (3000-1800 B.C.) in the Norte Chico region of Peru". Proceedings of the National Academy of Sciences. 110 (13): 4945. doi:10.1073/pnas.1219425110. PMC 3612639 . PMID 23440194. ↑ Moseley, Michael. "The Maritime Foundations of Andean Civilization: An Evolving Hypothesis". The Hall of Ma'at. Retrieved 2008-06-13. ↑ Moseley, Michael (1975). The Maritime Foundations of Andean Civilization. Menlo Park: Cummings. ISBN 0-8465-4800-3. ↑ Raymond, J. Scott (1981). "The Maritime Foundations of Andean Civilization: A Reconsideration of the Evidence". American Antiquity. Society for American Archaeology. 46 (4): 806–821. doi:10.2307/280107. JSTOR 280107. 1 2 3 Sandweiss, Daniel H.; Michael E. Moseley (2001). "Amplifying Importance of New Research in Peru". Science. 294 (5547): 1651–1653. doi:10.1126/science.294.5547.1651d. PMID 11724063. 1 2 3 4 Mann, Charles C. (7 January 2005). "Oldest Civilization in the Americas Revealed". Science. 307 (5706): 34–35. doi:10.1126/science.307.5706.34. PMID 15637250. ↑ Kinver, Mark (February 25, 2013). "Maize was key in early Andean civilisation, study shows". BBC News Online. Retrieved March 1, 2013. 1 2 3 4 Miller, Kenneth (September 2005). "Showdown at the O.K. Caral". Discover. 26 (9). Retrieved 2009-10-22. 1 2 Belsie, Laurent (January 2002). "Civilization lost?". Christian Science Monitor. Retrieved 2007-03-08. ↑ Hoag, Hanna (15 April 2003). "Oldest evidence of Andean religion found". Nature News (online). doi:10.1038/news030414-4. ↑ Hecht, Jeff (14 April 2003). "America's oldest religious icon revealed". New Scientist (online). Retrieved 2007-02-13. ↑ Braswell, Geoffrey. The Maya and Their Central American Neighbors: Settlement Patterns, Architecture, Hieroglyphic Texts and Ceramics. Routledge. p. 408. ISBN 9781317756088. ↑ White, Nancy. "Archaic/Preceramic (6000-2000 B.C. ): Emergence of Sedentism, Early Ceramics". MATRIX. Indiana University Bloomington. Retrieved 2007-03-08. 1 2 3 Atwood, Roger (July–August 2005). "A Monumental Feud". Archaeology. 58 (4). Retrieved 2007-02-27. 1 2 "Oldest city in the Americas". BBC News. 26 April 2001. Retrieved 2007-02-16. ↑ Mann, Charles C. (12 August 2005). "Unraveling Khipu's Secrets". Science. 309 (5737): 1008–1009. doi:10.1126/science.309.5737.1008. PMID 16099962. ↑ See 1491, appendix B. ↑ Hannah Hoag (15 April 2003). "Oldest evidence of Andean religion found". Nature. doi:10.1038/news030414-4. ↑ "Peruvian archaeologist accuses two US archaeologists of plagiarism". Athena Review (news archive summary). Athena Publications Inc. 22 January 2005. Retrieved 2007-03-08. ↑ From summary three, Shady (1997): El número de centros urbanos (17), identificado en el valle de Supe, y su magnitud, requirieron de una gran cantidad de mano de obra y de los excedentes, para su edificación, mantenimiento, remodelación y enterramiento. Si consideramos exclusivamente la capacidad productiva de este pequeño valle, esa inversión no habría podido ser realizada sin la participación de las comunidades de los valles vecinos. Sandweiss, D.H.; Solis, R.S. ; Moseley, M.E. ; Keeferd, D.K. ; Ortloff, C.R. (2009). "Environmental change and economic development in coastal Peru between 5,800 and 3,600 years ago". Proceedings of the National Academy of Sciences USA. 106: 1359–1363. doi:10.1073/pnas.0812645106. PMC 2635784 . PMID 19164564. Shady, Ruth; Kleihege, Cristopher, eds. (2008). Caral : la primera civilización de América = the first civilization in the Americas. Lima: Universidad de San Martín de Porres. ISBN 9972-33-792-8. Shady Solís, Ruth (2005). Caral Supe, Perú : the Caral-Supe civilization : 5,000 years of cultural identity in Peru. Lima: Instituto Nacional de Cultura. ISBN 9972-9738-4-0. Wikimedia Commons has media related to Caral-Supe.